The creators of this site were all early adopters of helmets and all have crashed at least once, landing on a helmet which clearly prevented serious injury. We advocate helmet use, but we don't regard mandatory helmet laws as a very good way to promote it. Some helmets provide better coverage, and protection, than others, and we recommend those that do. A helmet should preferably be bright-colored, for the best visibility during daylight hours, and reflectorized to improve nighttime visibility. A helmet can be a good place to hang a rear-view mirror, headlight or miniaturized video camera (or a plastic eagle), though at some small increased risk to the cyclist. No eagle yet. The T shirt reads "I Survived the Blizzard of '78." Sheldon's photo with his eagle helmet is on most pages on this site --but on the other hand, here are Sheldon's final words on the topic, from when he had multiple sclerosis. Actually, I no longer wear a helmet, because I am no longer able to ride a bicycle. These days, I ride a recumbent tricycle, which is so stable and so low to the ground that I don't believe a helmet is necessary. If by some miracle I become able to ride a bicycle again, however, I will go back to helmet wearing. The helmet protects the head against impacts from the side, front and back, as well as the top. I agree that top impacts are rare, but side and back impacts are common from falls. I encourage all bicyclists to wear helmets, but do not believe it should be a legal mandate. I don't know how much truth there is to it, but I've seen reports that suggest that when Australia, or maybe it was just one Australian state instituted a helmet mandate, the resulting decrease in bicycle use caused a rise in heart-related deaths greater than the reduction of lethal cycling head injuries. Most bicycle crashes do not involve a motor vehicle, and most impacts in bicycle crashes -- even in collisions with motor vehicles -- are falls from head height. These impacts are entirely able to cause permanent brain injuries or fatalities. Studies of helmets and of injury rates show that helmets should, and do, prevent or reduce injury. Bicyclists have a low injury and fatality rate in countries such as the Netherlands where terrain is table-flat, typical bicycle trips are short and slow, motorists are very cautious and bicyclists have priority in traffic. Still, wearing a helmet would increase safety of Dutch cyclists; and even more for other kinds of cycling and under other conditions. We recognize that the health advantages of cycling outweigh the added risk of not wearing a helmet, but why not improve the odds? The popularity of helmets differs greatly from one country to another, and between types of cyclists and styles of cycling. 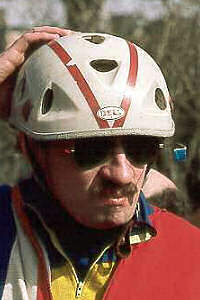 Helmet use has been common among racers for many decades, and became nearly universal among avid cyclists in the USA and Canada within a few years after effective helmets became available. We understand that helmet use is also common in Sweden; it is required by law in some parts of Australia and to varying degrees (often, only for children) in some states in the USA. Such laws requiring helmet use are very controversial among bicycling advocates, because people with a light commitment to bicycling may decide not to ride a bicycle if they are forced to wear a helmet. Unless helmet use is already largely universal and strongly enforced -- not the case anywhere in the USA -- laws are less effective than helmet promotions in convincing people to wear a helmet. Strong support for these laws, however, comes from outside the bicycling community, and if a helmet law is going to pass, it needs very close attention to avoid devastating unintentional consequences. A bicyclist's not wearing a helmet should not be admissible in a court of law as evidence of fault in a crash. This liability exclusion is usual in safety-equipment laws, to avoid placing the legal responsibility for a crash on someone who was operating according to the rules of the road. Well-meaning safety advocates often are unaware of this issue. Aside from compulsory helmet laws, the primary helmet issue to an individual is the risk that he or she is willing to take (and to impose on family, friends and society at large) -- versus the cost and inconvenience of the helmet. An individual making a free-will decision to purchase and wear a helmet probably has already decided to ride a bicycle. An individual forced by law to wear a helmet may not have made that decision, and some studies show a reduction in bicycle use if helmet laws are enforced. Also, some studies that look at a population at large show no reduction in fatality rates with helmet laws. This situation has been attributed to a low actual percentage of helmet use and by some to "risk homeostasis" -- that cyclists who wear helmets might compensate by taking more risks -- which, on the other hand, can mean riding more and taking trips that would otherwise be avoided. A person riding his or her own bicycle will generally have a place to store the helmet at the beginning or end of a trip. For a shopping trip, it is possible to leave the helmet on the head or place it in a shopping cart. Helmet use has become a more complicated issue with the advent of shared-use bicycles. Helmet sharing risks transmitting head lice and has an "ick" factor. There have been a few trials of dispensers at dock bike-share stations that sanitize helmets. Dockless bike share and e-scooters don't allow this option. Folding helmets, easier to transport, have been marketed, but are not common and are one more thing for a person to carry around. Bicycle helmets have evolved over the years, but the bicycle helmet as we now understand it first appeared in the mid-1970s. 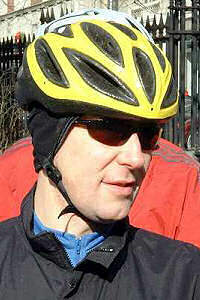 Bicycle racers commonly used the so-called "leather hairnet" until better designs with optimized impact protection superseded it. 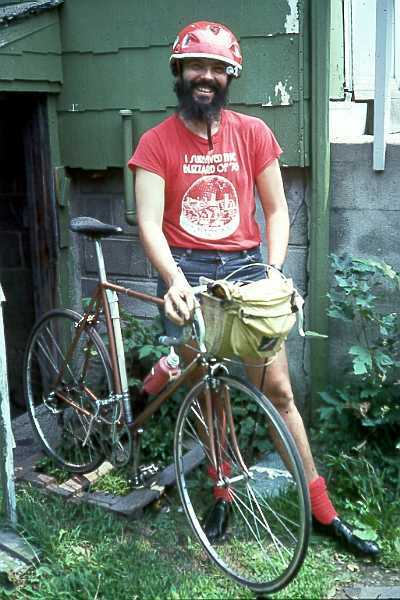 A few cyclists, notably Dr. Eugene Gaston, medical columnist for Bicycling magazine, had taken to wearing hockey or mountaineering helmets around 1970. Club riders and racers saw the need for head protection, but there was not yet a helmet optimized for best protection compatible with light weight, unobstructed vision and ventilation. 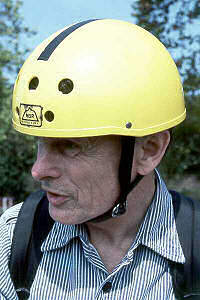 Around 1973, a Seattle, Washington, USA company, Mountain Safety Research, introduced a modified mountaineering helmet which used cloth webbing attached by eight deformable side clips to provide impact absorption. MSR later added EPS (expanded polystyrene) foam inserts between the webbing straps. The next year, Bell introduced the Bell Biker, the first helmet designed from scratch specifically for bicycling. It used EPS as its impact-absorbing material, and had tapered ventilating inlets, as do most other bicycle helmets made since. Standards and test methods for bicycle helmets have been set (in the USA) by the American National Standards Institute (ANSI), the Snell Memorial Foundation, the American Society for Testing and Materials (ASTM) and currently, the United States Consumer Product Safety Commission (CPSC). Hardshell: The MSR and Bell helmets, and other early ones, were of this type. They had a hard plastic shell, to resist penetration by pointed rocks, curbs, etc. Most skate-style helmets are still made this way. No-shell: for a short while, in the late 1980s, helmets were produced with the expanded polystyrene shell covered only by thin cloth. 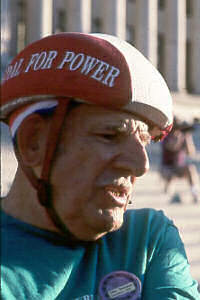 Jim Gentes, who founded Giro, designed the first such helmet. This helmet passed the helmet-testing standards of the time and weighed less than other helmets, but questions arose as to whether the polystyrene might snag on rough pavement, causing brain and neck injury due to head rotation. Also, such helmets would often break apart on impact. Thin-shell: The plastic shell is too thin to provide protection against object penetration, but it does provide a smooth surface to avoid snagging on rough pavement, and helps to hold the helmet together on impact. In high-end helmets with big vents, reinforcing of plastic, nylon or more exotic materials is molded inside the expanded polystyrene. Most helmets made and sold since 1990 are thin-shell helmets. There has been heated controversy ("helmet wars") among cyclists and cycling advocates about helmet laws and helmet use. Helmet skeptics are primarily libertarians opposing helmet laws and riders who see helmet advocacy as unthinking protectionism. Although small in numbers, they are adamant, and fill blogs and bulletin boards with anti-helmet messages, giving rise to the term "helmet wars". Bicycling advocates who dismiss helmet use generally assume that the greater good is achieved by convincing more people to ride bicycles, even at the expense of avoidable injuries. Helmet advocates, on the other hand, have included not only many safety-conscious cyclists but also generalist safety advocates -- in particular in the USA, Safe Kids USA. Both sides have more in common than they might think: both like to make decisions for other people. Both often fail to consider unintended consequences. Helmet opponents consistently deny the robust scientific data supporting helmet use. Non-cyclist helmet advocates have had to learn that there is more to safe bicycling than helmets; that promotional campaigns and helmet giveaways to low-income people are more effective than laws; and that fairness requires a helmet law to include a liability exclusion. It's a classic case of imposing of one view or another of the interest of society, versus self-interest based on an individual's best judgment. The "dangerization" of bicycling has a bad taste for us, but so does dismissal of the real benefits of helmet use. It has correctly been asserted by advocates on both sides that avoiding a crash is preferable to crashing in a helmet. But beyond this, safer roads, careful and skillful cycling and use of other safety equipment, particularly lights at night, reduce injury risk to the entire body more than wearing a helmet on the head. Physical exercise from bicycling increases life expectancy more than risk decreases it, even without a helmet -- though this last argument fails to take quality of life into account. Exercise increases life expectancy by a few years for large number of people, while helmet use can increase it by decades for those who crash, and also prevent long-term disability. There is also no reason to think that bicycling is the only form of exercise that a person avoiding helmets would use.